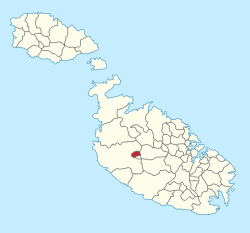 Mtarfa (Maltese: L-Imtarfa) is a small town in the Northern Region of Malta, with a population of 2,572 people as of March 2014. It was considered to be a suburb of Rabat until 2000, when it became a separate local council. 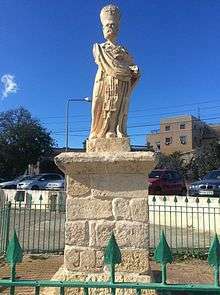 In the Roman period, Mtarfa was a suburb of Melite, and it contained a Temple of Proserpina. The ruins of the temple were destroyed in the 17th and 18th centuries and the stones were reused in other buildings. Substantial remains of the suburb itself, including the arrangement of the streets and many tombs, survived until the late 19th century. In 1890, British military barracks began to be built in Mtarfa, destroying most of the Roman remains in the process. A clock tower, now a prominent landmark of Mtarfa, was built in 1895. 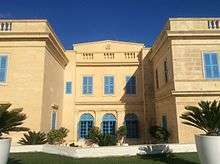 A naval hospital, RNH Mtarfa, was built during World War I, and it has now been converted to a state secondary school, named after Sir Temi Zammit. A chapel dedicated to St. Oswald was built by the British after the end of World War I. After the British left Malta, the barracks were converted into housing, and the town expanded into a modern residential area. In April 2008, due to failure on the part of the council to meet at least once a month as required by the Local Council Act, the Prime Minister Lawrence Gonzi recommended to the President of the Republic to dissolve the local council and to set up a temporary committee to administer the affairs of the locality. The Mtarfa local council had failed to meet since November of the previous year allegedly over disagreements on the appointment of the council's Executive Secretary. Mtarfa has its own football club Mtarfa F.C. Founded in 2006, the club took part in the Maltese Third Division for the first time in their history in the 07/08 season. They have entered the Malta Football Association in lieu of Ta' Xbiex F.C., who lost their status due to their consistent poor results in the lowest of Maltese divisions. ↑ Caruana, Antonio Annetto (1882). Report on the Phoenician and Roman antiquities in the group of the islands of Malta. Malta: Government Printing Office. p. 94. ↑ Cardona, David (2008–2009). "The known unknown: identiﬁcation, provenancing, and relocation of pieces of decorative architecture from Roman public buildings and other private structures in Malta". Malta Archaeological Review (9): 43. ↑ "RNH Mtarfa". OpenBuildings. Retrieved 3 July 2015. ↑ Scerri, John. "Mtarfa". 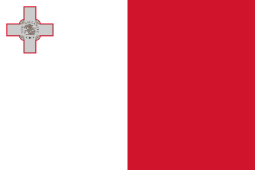 Malta-Canada.com. Retrieved 3 July 2015. ↑ "Temporary committee to take over at Mtarfa". Times of Malta. 22 April 2008. Retrieved 3 July 2015. Wikimedia Commons has media related to Mtarfa.